(CNN) -- Investigators are pleading for help in hunting down whoever triggered a pair of bombings that left a gruesome scene at the Boston Marathon. The blasts, which killed an 8-year-old boy and two others, marked a grotesque end to what should have been a celebration of triumph. One man's legs were instantly blown off, yet he kept trying to stand up. "No piece of information or detail is too small," the FBI Boston Division said, asking the public for any information or images that might provide clues. While authorities search for answers, many are at a loss to explain why anyone would target the annual event that celebrates thousands of runners from around the world. Both blasts happened in quick succession, near the row of international flags that led up to the finish line. The impact was so powerful, it whipped the limp flags straight out, as if they were caught in a hurricane. It also knocked 78-year-old runner Bill Iffrig to the ground. "I was just approaching the last straightaway to the finish line, and I had a good day and was feeling really good, and I got down to within about 15 feet of the finishing apron and just tremendous explosion, sounded like a bomb went off right next to me," Iffrig said. "The shock waves just hit my whole body and my legs just started jittering around. I knew I was going down," he said. Iffrig was not seriously injured. But trails of blood, severed arms and legs and other body parts littered the scene nearby. At least 144 people were hospitalized, with at least 17 in critical condition and 25 in serious condition, officials said. At least eight of the patients are children. Dr. Albert Pendleton, an orthopedic surgeon who was helping staff the race's medical tent, told CNN on Tuesday it was "basically like the bomb took out he legs of everybody." "It was horrific," he said. A terrorism expert briefed on the investigation said doctors had removed ball bearings from patients wounded in the bombings, suggesting the bombs were designed to propel shrapnel. At Massachusetts General Hospital, several patients suffered from injuries to lower limbs that will require "serial operations" in the coming days, trauma surgeon Peter Fagenholz said Monday night. He said the most serious wounds "have been combined, complex lower injuries that involve blood vessels, bone and tissue." Numerous patients had to have limbs amputated, Fagenholz said. Investigators don't know who was behind the attack, or whether it was spawned domestically or from afar. But federal authorities are classifying it as an act of terrorism. Federal and local investigators -- including bomb technicians -- searched an apartment in nearby Revere, the city's fire department posted on Facebook early Tuesday. The search took place by consent, according to a federal law enforcement source, meaning no search warrant was needed. But authorities have not officially linked the search to the marathon bombings. A federal law enforcement official said both bombs were small, and initial tests showed no C-4 or other high-grade explosive, suggesting that the packages used in the attack were crude. President Barack Obama, who said Monday the bomber or bombers would "feel the full weight of justice," received overnight briefings on the investigation, a White House official said. 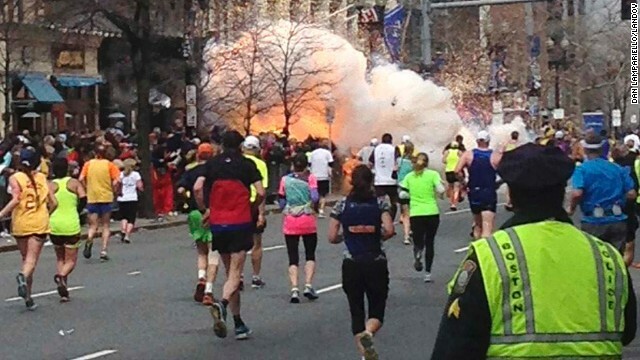 The explosions went off near the finish line about 4 hours and 9 minutes into the race, within a 10-minute window of the average finish time for the marathon. But the fact that the blasts took place near the end of the race "seems to indicate this was not geared toward maximum damage," said a former federal law enforcement official who now works in the intelligence community. "It may speak volumes about the (level of) planning that went into this," the source said. "It raises questions ... why didn't the bombs go off when the crowd was packed in like sardines when the winners were crossing the finish line? It could mean the people behind it couldn't get access to the area when they originally intended." Officials have no suspect in custody, but many people are being questioned, Boston Police Commissioner Ed Davis said. Davis said authorities found at least one other explosive device that they were dismantling. But Rep. Bill Keating, D-Massachusetts, said two undetonated devices were found. One was discovered at a hotel on Boylston Street near the bomb site, and another was found at an undisclosed location, said Keating, a member of the House Homeland Security Committee. He called the bombing a "sophisticated, coordinated, planned attack." Any unexploded devices could provide a treasure trove of information such as fingerprints and indications of the bomb maker's design, said the former federal law enforcement official. Late Monday night, authorities said they were still getting reports about suspicious packages, but some may be abandoned belongings left by fleeing spectators. Davis said that while no new devices had been found, he is "not prepared to say we're at ease at this point in time." Nurses Stephen Segatore and Jim Asaiante were stationed near the finish line, expecting to treat the usual ailments from runners -- cramps and dehydration. Suddenly, they found themselves in a battlefield, with blood and debris everywhere. "For me, it was just like going back to being in Iraq in 2006-2007," said Asaiante, an Army captain who served an 18-month tour. "I heard the first IED, and I know there's never one. The bad guys always set up two or three" improvised explosive devices, he said. The plumes of smoke and images of bloodied victims running down streets also triggered haunting memories of the terrorist attacks of 9/11. Tami Hughes had just crossed the finish line and was looking for her husband when she heard a deafening explosion. "I didn't know if it was a small aircraft going into the building," said Hughes, who was in the bustling financial district during the 9/11 attacks. "I turned around and immediately saw the whitish-brownish smoke billowing up four or five stories and I couldn't believe that, you know, could it be a bomb? And I stared at it and about five or seven seconds later, when the second one went off, I knew immediately that it was something coordinated or organized." The Boston Marathon is the world's oldest annual marathon, dating back to 1897. It's a tradition that not only symbolizes the arrival of spring in Boston, and it also marks Patriots Day, which commemorates the day of the opening battle of the Revolutionary War. Each year, more than 20,000 pound the pavement through the winding streets of Boston as thousands of spectators cheer them on. After Monday's tragedy, some wondered whether the spectacle would ever happen again. "The Boston Marathon has endured two world wars and many other things," said Fred Treseler, who has helped train more than 3,000 athletes for the race. "I am quite sure there will be a Boston Marathon next year. But for certain, the Boston Marathon has been changed forever." CNN staff in Boston, New York, Atlanta and Washington contributed to this report. My prayers and thoughts go out to the loved ones of the victims of the Boston Marathon Bombings.